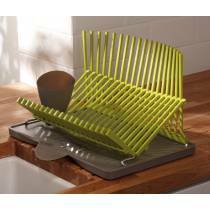 Contemporary and highly functional dish racks inspired by architecture that add a little colour and personality into your kitchen. The sculptural shape folds down to a flat compact shape for easy storage. The wave of spikes can be used to hold even your most delicate champagne glasses upright. 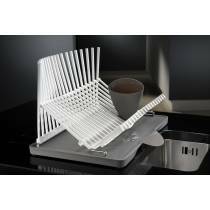 There is a drainage tray which has an ingenious flip up spout so that you can choose to drain or not, depending on your kitchen set up.